Here is a list of videos that have devilsticking in them. I have only listed the videos I have seen or heard about, so I may be missing some. If you know of any then please email me. I finally broke down and purchased this video. Not bad, but a bit basic. I was hoping he would get into a little more advanced tricks or combinations, but it covers most of the basic tricks. You can take a look at my video index of the tape to see everything it contains. It can be purchased from Dube Juggling or Serious Juggling. Video from Stixguru Michael Sather. This review has been a long time in coming. I've had the video for a few years and never got around to writing up a review. So here it finally is. 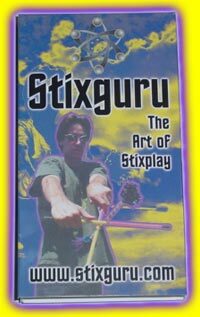 Stixguru - The Art Of Stixplay is a 77 minute video packed with tricks, tips, and lots of great stuff. It has a pretty standard format with seven different sections of tricks (Patterns & Variations, Bodyplay, Balancing, Releases, Flourishes, Juggling, and Doubles), and various jam sessions in between. It's in these jam sessions where you can see him putting together some of the tricks he has demonstrated (cool stuff). When demonstrating a trick it is shown in normal speed, then a slow motion replay, and usually another shot from a different angle. Many of the tricks are shown from numerous angles, so there are plenty of opportunities to figure the tricks out. He does not talk during the tricks, which I didn't mind at all (just show me the tricks!). Michael has a Jay Gilliganesque look to himself (especially with those glasses), along with a very fluid style to his sticking. As I said, he does not say much on the video, but one of the best comments at the beginning is "It's not about learning every trick, it's not about being the best in the world, it's all about the evolution of your personal style." And that's what really shows on this video. His style is a mix between the Dead Head stickers, and their mostly helicopter moves, and more traditional devilstick propeller moves. In his jam sessions he moves between helicopter, propeller, saw and body moves with ease. It's often one of the extra flourishes he adds that moves each trick and transition to the next level. I'm not big into flowersticks, but I think Michael is most likely using a LunaStix devilstick (he used to work for Liston Concepts). It almost looks like the hand sticks are a bit shorter than normal, but I have not seen a set of LunaStix before. I haven't met Michael before, so don't know much about what other juggling props he likes (he does do some good three ball stuff at the end), but you can see the influence of other props on his sticking (which makes sense because of the "Juggling" section). So regardless if you primarily use a flower stick or a tapered devilstick, this is a video you don't want to pass up. Just bought a copy of this from Serious Juggling. Will try posting a review once I see it. Ok, what can I say about this video. I guess it's the video that I would have made years ago if I had the time (well, not everything in it, and I wouldn't have spoken in Japanese ;). But there are a plethora of tricks on this video that I have on my website. Out of 140+ tricks demonstrated, almost half of them are on my site. And that wouldn't be too much of an issue if there was at least some credit to my site. I mean, who else would call a trick like the Egyptian Buzzsaw, or the Figure 8, with the same name? I do have to say it's nice to see so many tricks named the same thing, so at least there is no confusion with tricks learned from devilstick.org and ones from the video. Ok, enough history, you all are wanting to know how good this DVD is and if you should buy it. There is some excellent stuff on this video, and after watching it I finally felt like someone put out a worthy devilsticking video (without using flowersticks), that had some nice advanced tricks. There are three main demonstrators and each of them seems to be strong in different areas (for instance Sioux seems to do most of the helicopter style tricks). [I found it interesting that all three demonstrators were using Dube Trigon sticks.] There are 4 Basic sections (idling, propeller, helicopter, and saw), and then 9 advanced sections (idling, propeller, helicopter, saw, balance and contact, handsticks, start and finish, dual devilsticks, and team play). Interspersed within each of the sections is commentary on a number of items such as carrying bags, stick maintenance, body care, combat, and devilstick volleyball. There are also demonstrations by each of the presenters. This is a good chance to watch them put together a number of the tricks that are explained, as well as a few that were not. Each of them has a particular style to their play, and I enjoyed all three demonstrations. As I mentioned above, there are over 140 different tricks and variations of tricks demonstrated (here's the list of tricks), so plenty for people of all skill levels to learn something. The speaking is done in Japanese, but there is also an English audio track as well. So, if you are looking to learn some new tricks, or for people who learn from visuals much better than text descriptions (like on this site :), then you will definitely want to pick up a copy of this DVD. I'll also agree with how Matt Hall ended his review, "Let the devilstick renaissance begin!" Hear, hear. There is a little over 8 minutes of devilsticking on this tape. It is in the second section of the tape (you can refer to my video index of the tape for exact times). I was surprised that there was actually some pretty good stuff on this tape. The devilstick section starts off with Todd Strong showing the basics of devilsticking. Andrew Allen (Neil Stammer) then joins Todd and they each do a trick or two with the devilstick and then pass it to the other person. There are a few really good tricks that each of them demonstrate. Todd then does two devilsticks the "chopsticks" way. An instructional video on devilsticking. Have not seen it. I am currently making my way through all of the IJA convention tapes and DVD's. Most of the early tapes don't have much on them. However, starting in 2005 they started including the prop competitions on the DVD's and there have always been a few individuals competing in the devilstick competition. So, compared to earlier years videos that contained just a few quick shots (the '95 IJA Championships tape is an exception), these have some good stuff on them. There is a quick spot on this tape (about 8 seconds) of Bryan Wendling doing two devilsticks on the Renegade stage one evening. The Renegade spot is between 39:30 and 39:38 on the tape. There is a longer spot on this tape (about 36 seconds) of Bryan Wendling doing two devilsticks on the Renegade stage one evening. He idles a devilstick in each hand with a couple stalls then drops one to the floor resting on his foot. He then goes into a quick juggle and puts the devilstick into a chin balance. He then does a kickup and double taps the devilstick and then drops the one from his chin back into a double idle. The Renegade spot is between 33:13 and 33:49 on the tape. There are a couple of brief shots of a guy doing some helicopter stuff with a devilstick. Neil Stammer does a devilstick routine in the public show. He starts off with manipulating the devilstick like a staff and then pulls out two handsticks for his routine. He has some very quick and crisp moves in his routine but I didn't see anything really innovative. His public show routine is around 17:30 to 21:05 on the tape (the video editor cut short his devilstick routine). I picked up a copy of this from Serious Juggling. Jochen Schell did an excellent devilstick routine in his performance. It is a very smooth and flowing routine choreographed to music. (Just a little too short, I wanted more!) 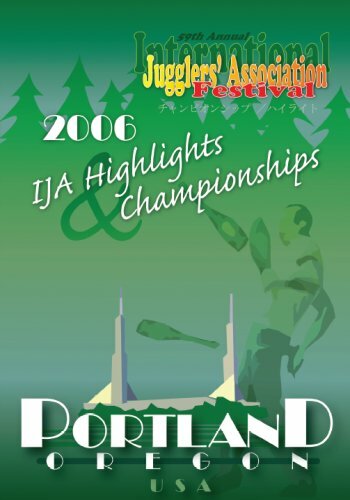 If you are interested in getting this tape then you can go to the IJA Store and look in the Championships section for a copy. 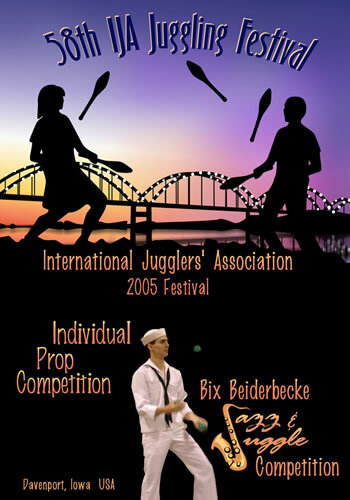 Read on rec.juggling that there was a performer from Germany, Henning Wiescher, who did a devilstick routine in the show. Here is what the reviewer on r.j said "Henning Wiescher from Germany did a high powered routine with one and two devil sticks, including some great double propeller moves." I bought a copy from Alan Plotkin Festival Video Productions. After watching the tape there is a 2 minute 15 second spot of Henning doing devilstick. He does alot of nice helicopter moves and then does two devilsticks. Most of his two devilstick routine is propeller spins. However, he has a very nice two devilstick start where he balances one devilstick horizontally on the end of the second devilstick. He then balances this "T" on the end of one of his handsticks. He raises the devilsticks in the air and drops them. As they drop he catches each devilstick on a handstick and starts propeller spins. Very nice. Three individuals competed this year, Luke Wilson, Michael Sather, and Matt Hall. I'll cover each of their performances below. First off, I have not been to a convention in a number of years. But from what I remembered the prop competitions were for creativity and drops did not count. That did not seem to be the case now since the judges talked about drops and such. I'd rather it just go back to innovative stuff and not worry about the drops. I really wish that they did not have so many problems with the sound tracks for the devilstick performers. Luke had started a great routine and right in the middle the music stopped. He did complete the routine without music after a short interruption. Anyway, there was a number of nice items that Luke did in the routine. He did a number of things with arm traps that were pretty cool. Also when he juggled the devilstick and handstick, the handsticks did flips and he did a flat with the devilstick which looked very nice. Many of the other tricks were pretty standard, but were done in a very crisp slick way. Later on the DVD Luke competes in the club competition and his routine was awsome (which is why he won it). It looks like alot of his moves on devilstick came from his club moves. I can see him easily working some more of the club moves to devilstick and having an equally awsome, very original, devilstick routine. Very cool stuff. If you have not seen Michael's Stixguru video (reviewed above), then you need to go get a copy now. His performance here had quite a few of the same tricks and style, and there were also a number of items that were new. Michael was using a flowerstick for the performance, so there were a number of tricks that are virtually impossible to do with a tapered devilstick. One of these was a nice trick he did where it was a half flip of the flowerstick all behind the back, but it had to be done by spinning it around the "bells" at the ends of the flowerstick. There are a number of items where you could translate the flowerstick moves to a tapered devilstick, so it's well worth watching the routine to pick up something new. And in similar fashion to some of the jam sessions Michael had on his Stixguru video, it seemed the flowerstick and handsticks were in constant motion. He would thrown in a flourish with a handstick rather than it just sitting idle in his hand, and this really made his routine nice to watch. Matt's routine was pretty good. Most of his tricks were familiar from ones on my website, or if you've seen the Fantastic Devilstick video reviewed above. I'd love to see Matt start cranking out tricks on the devilstick like he does on the diabolo. Michael placed first, Luke second, and Matt third in the competition. There were three competitors again this year in the devilstick prop competition. And like last year there were two people who used tapered devilticks, and one who used a flowerstick. Blake had some pretty interesting tricks during his performance. He suffered a bit from all the drops, but you could tell he was intent on showing some new tricks of his (and I applauded him for that). There were quite a few arm trap type of tricks, and some of these were pretty cool. Many of these involved releasing the handstick, catching it, and then trapping the devilstick again. Definitely some things to play around with from this routine. This routine was done very well and there were no drops (which is why he probably won). However, there was nothing new in this routine that most people have not seen before. There were a couple difficult tricks that he did, and when he does the egyptian buzzsaw he needs to face the audience so you can see what you are doing with the handsticks. Everything he did was very good, and you could tell he has great control of the devilstick, but I wanted to see something original. Yohei also competed in the three ball competition where it seemed that he tried a number of interesting and difficult tricks. I just wanted to see him do that with the devilstick, because you can tell by how flawlessly he performed his devilstick routine that he most likely has more interesting/difficult tricks he could do with the prop. I had heard of Aaron Young just before I watched this DVD. He made an annoncement of a new video that he is releasing on a devilstick mailing list, so I was interested in seeing his routine. I have to say that I was quite impressed. He's the best flowerstick player I've seen since Michael Sather. I'd say he's similar to Michael in some of the difficulty and types of tricks, but his style is a bit different. Since he used a flowerstick there were a number of tricks that would be difficult to perform on a tapered devilstick, but like Michael's routine the year before, there are still a number of things one can pick up and learn from Aaron's routine. If he didn't make a couple of his drops at the end he would have won the competition since the point differential between Aaron and Yohei was so close. Yohei Ota won first place, Aaron Youg won second, and Blake Speers won third. 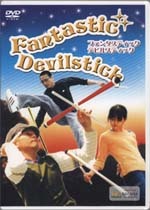 There was one competitor in the Championships this year that used devilstick, Yohei Ota. Yohei had a similar routine that he did in the prop competition. Again he was flawless with his single stick routine. I was reminded when I watched this how nice his propeller to helicopter then back to propeller hits are. In one swift move he can change the direction of spin. He ended his routine with a kickup into two devilstick propellers, which he dropped twice. Other than that, I thought it was an excellent routine to further highlight this prop in front of the juggling commnity. A good 2 minute devilstick routine by Sam I Am (?!?). If you have never seen Markus Furtner do two devilsticks then you have not really seen anyone do two devilsticks. This guy is amazing. Henning Wiescher's web site, www.devilstick.de, has 60 or so animated GIF's of various tricks. There is now a English translation (link at the bottom) of his pages as well. As I mentioned in my review of Michael Sather's Stixplay video above, all his tricks are now available from his web site, stixguru.com. Lunastix now has a section under their tricks tab with quite a few videos on it. Circusplanet has a couple of good "Best Of" videos from 2005 and 2006 which has one of the members, Rob Boaron, doing some devilstick stuff on it. A few of these tricks are pretty cool and well worth checking out. Also, be sure to go to the devilstick section where there are a half dozen or so additional videos of Rob and one of Nikki Snijders. One warning is that the download speed for this site seems REALLY slow, so it may take a while to download some of the longer videos. Of course be sure to do a search on YouTube for devilstick. There are quite a few good videos being posted.